Chemcatcher® is a device used for the passive sampling of a wide range of pollutants typically found in aquatic environments. It allows the detection of pollutants in water bodies where levels fluctuate over time and when chemicals are only present at trace, yet toxicology significant concentrations. It’s low cost, ease of use and no maintenance make it a perfect device for deployment in potable, surface, coastal and marine waters. It is suitable for deployments of days to months. It comprises of a robust three component body in two different sizes. 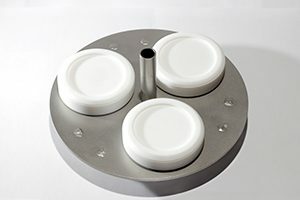 By altering the combination of receiving phase and diffusion limiting membrane Chemcatcher® can be deployed for the detection of: Metals, Radionuclides, Organometallics, Polar organics, Metaldehyde and Non-polar organics. After deployment Chemcatcher® provides results in the form of time-weighted averages or equilibrium concentrations allowing the user to obtain a more representative picture of the chemicals in the aquatic environment. The use of commercially available receiving phases allows high reproducibility. 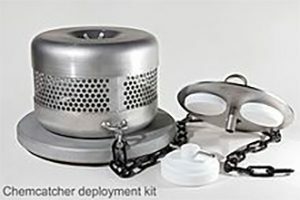 A popular application is the non-polar Chemcatcher. Recent applications include the measurement PAHs, PCBs, and specific pesticides. Performance reference compounds (PRCs) can be used to correct for any variations in environmental conditions (e.g. changes in water temperature and turbulence) during a field deployment. Such variations are then taken into account when estimating the TWA concentration during the exposure period. There has been recent interest in monitoring polar chemicals in water. This class includes polar pesticides (e.g. acid herbicides) and emerging pollutants such as pharmaceutical residues and personal care products. Two designs of Chemcatcher® are available to sequester these types of chemicals. Normally a diffusion-limiting membrane is employed also. Performance reference compounds (PRCs) cannot be used effectively with this version of Chemcatcher®. Metaldehyde is a potent molluscicide and is the active ingredient in most formulated slug pellets. Large quantities of pellets are used in some agricultural areas at specific times in the year to control infestations in crops. As a consequence, often high concentrations of metaldehyde can found in surface waters after significant rainfall events. Chemcatcher® can be used to measure metaldehyde in water. The Water Framework Directive (WFD) was introduced to achieve protection and sustainable development of water resources in the European Union (EU) countries through established Environmental Quality Standards (EQS). The directive sets annual averages and maximum allowable concentrations for inland and other surface waters for the dissolved fraction of some trace metals including nickel (Ni), cadmium (Cd), lead (Pb), zinc (Zn) and mercury (Hg) which are potentially quite toxic to aquatic life. Applications include the measurement cadmium, copper, lead, mercury, nickel and zinc. The Fukushima nuclear reactor incident in 2011 led to the release of large quantities of radioactive isotopes into the environment. Of particular concern was the impact of radio-caesium in different environmental compartments. Chemcatcher® has been shown to be effective in monitoring radio-caesium in contaminated water bodies. This work was undertaken by the Chiba Institute of Technology (Tokyo, Japan). Information obtained from using the device has helped to inform the environmental fate of radio-caesium and to assess the effectiveness of different remediation measures. This can measure organotin compounds including monobutyltin, dibutyltin, tributyltin (TBT) and triphenyltin. These are all highly toxic to fish and marine life. They are known to be severely irritating to humans. We offer bespoke training courses on how to prepare, assemble and deploy Chemcatcher® passive sampling devices. We also offer consultancy services including preparation, deployment/retrieval of the Chemcatcher® and types of passive samplers. We can provide analysis of the receiving phase disks for a wide variety of pollutants and prepare reports on the findings. Please contact us to discuss your specific learning and monitoring requirements. The Chemcatcher concept was developed by Professors Richard Greenwood and Graham Mills at the University of Portsmouth, together with colleagues from Chalmers University of Technology, Sweden. The device is patented in a number of countries and the name is a registered trademark in the United Kingdom.